Greek Prime Minister Alexis Tsipras has called on the EU to “do all it can to support” Turkey which is currently hosting 4 million refugees. In an exclusive interview with Anadolu Agency and Furkan Naci Top, Tsipras answered questions on Turkey-Greece relations, the refugee crisis and the long-standing Cyprus issue. “I believe that Turkey has taken over the great burden of hosting 4 million refugees. That should always be recognized by the international community and the EU should do all it can to support our neighbor,” said the Greek premier who will pay a two-day visit to Ankara and Istanbul this week. A Turkey-EU refugee deal reached in March 2016 aims to discourage irregular migration to Europe through the Aegean Sea. “As a result [of the deal], illegal flows and especially deaths in the Aegean, drastically decreased,” Tsipras said. The deal included a €6-billion ($6.8-billion) aid package to help Turkey care for millions of refugees in the country. However, Turkey has so far received only a part of the committed amount. The agreement also allowed for the acceleration of Turkey’s EU membership bid and visa-free travel for Turkish nationals within the Schengen area. Tsipras also said Turkey and Greece should “intensify” their cooperation regarding the refugee flow since “the Greek islands have been overburdened in the last few years”. The prime minister also claimed his country has one of the fastest asylum procedures and they are “working hard” to make it more effective. Some European leaders, such as Angela Merkel, blamed the Greek side for the deal not “working properly”. “The EU, for its part, has to find a way to strengthen the support it shows to countries that are the most affected from the flow and to reject agendas that are not compatible with European law or humanitarian principles,” Tsipras said. Asked whether there is a possibility of new talks on Cyprus issue, Tsipras said the sides should keep working for “a fair and viable solution based on UN Security Council decisions” despite the elections in both countries scheduled for this year. “The reunification of the island on this basis, is the only possible solution,” he said, calling for “effective preparatory meetings” on the security issue with the Turkish side. There has been on-and-off peace process over recent years. The Crans-Montana talks in 2017, which has been the latest initiative, under the auspices of guarantor countries Turkey, Greece, and the U.K. — ended in failure. 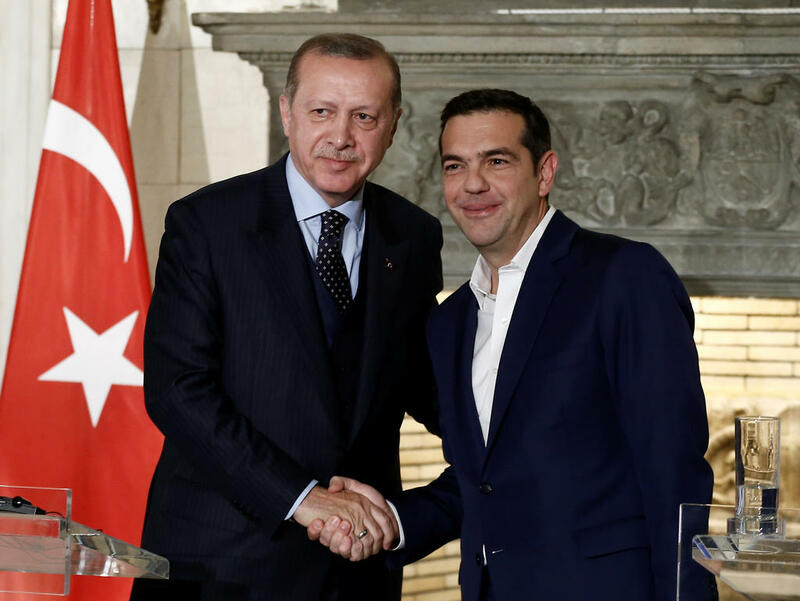 On his personal relationship with the Turkish President Recep Tayyip Erdogan, the Greek leader said it is based on “respect, honesty and directness” although it was “challenged in very difficult moments”. “But it allowed us to consolidate channels of communication on many levels, to overcome obstacles and to be able, today, to speak of a positive agenda,” he said. “During my visit I believe we will have the chance to continue the difficult, but frank dialogue we started in December 2017 and to pick up our positive agenda from where we left it,” he added, recalling the Turkish president’s visit to Athens, which was the first at the presidential level after 65 years. The Greek prime minister is scheduled to meet the leader of Istanbul’s Fener Greek Orthodox Church Patriarch Bartholomew after his visit to Ankara. Tsipras also talked on the developments regarding the Muslim Turkish minority’s religious freedom in Greece, an issue which was raised by Erdogan in his 2017 Athens visit. “The Treaty of Lausanne is the applicable international convention regarding minorities, so we inform each other on relevant developments on this basis,” Tsipras said, branding the issue as an internal one rather than bilateral. “We have made important steps until now on the implementation of Sharia law, the structure and function of the Mufti offices and educational issues. We will continue in this direction,” the Greek leader said.